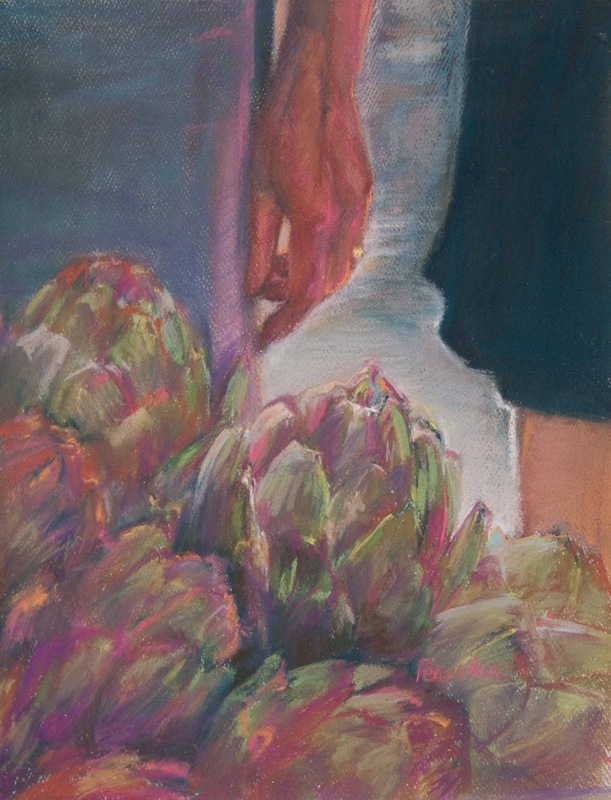 Sarah Peroutka Studio: Artichokes at Portland Farmers Market and "Who Does She Think She Is?" Artichokes at Portland Farmers Market and "Who Does She Think She Is?" Today's featured painting, "Artichokes at Portland Farmers Market," has been donated to the Oregon Repertory Singers for inclusion in the silent auction segment of their annual fundraising event Oregon Repertory Singers in Paris Sing Les Miz on Saturday, February 25, 2012, at the Governor Hotel. My sister Andi Bachhuber is a member of ORS and has the voice of an angel! I hope those who live locally will be able to attend to enjoy the entertainment, generously bid on some fantastic auction items and support this incredible organization. Pamela Tanner Boll's 2008 documentary movie "Who Does She Think She Is?" explores the ways in which a handful of female artists balance motherhood and their active careers. Highly recommended. Labels: artichoke, farmers market, hand, Les Miz, movie, Oregon Repertory Singers, Pamela Tanner Boll, pastel, Who Does She Think She Is? My vision is to be a creatively productive artist, living a healthy and abundant life, strongly connected to my family, friends, spirit, and community. I currently enjoy painting with soft pastels. From time to time I put the names of my followers into a hat and draw one out to receive a credit toward my artwork. So easy! Want to play? Next Drawing for a Painting: Just click "Join this site" and your name will be entered.